Here you'll find everything you need to know about water in the home. Whether you're bathing your baby in the sink or splashing around with your toddler in the bathtub, water is great fun for kids. But it's also a place where safety must come first, so here are a few tips for kids who love to get wet. Among preventable injuries, drowning is the leading cause of death for children 1 – 4 years old. 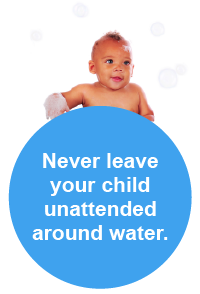 Children less than a year old are more likely to drown at home in the bathroom or a bucket. Watch kids when they are in or around water, without being distracted. Keep young children within arm’s reach of an adult. Empty all tubs, buckets, containers and kiddie pools immediately after use. Store them upside down so they don’t collect water. Close toilet lids and use toilet seat locks to prevent drowning. Keep doors to bathrooms and laundry rooms closed. Install fences around home pools. A pool fence should surround all sides of the pool and be at least four feet tall with self-closing and self-latching gates. Know what to do in an emergency. Learning CPR and basic water rescue skills may help you save a life. Want more information about safety in and around water? Check out some additional tips. Watch and learn quick and helpful water safety tips in seconds! Parents tell Gary on the Street what they know, and don’t know, about protecting their kids from drowning at the pool. Safe Kids research finds parents have misconceptions about drowning prevention, water safety and keeping kids safe in pools, lakes and bathtubs. Safe Kids uncovers 4 misconceptions many parents have about preventing children from drowning and offers water safety tips.